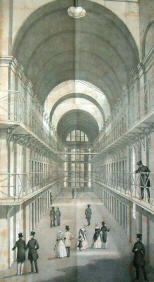 Pentonville was the first prison in Great Britain to put into practice the enlightened ideas of the prison reformer, John Howard. Built in 1840-42 to the designs and under the direction of Major (later Sir) Joshua Jebb, Surveyor General of Prisons, it pioneered the separate housing of inmates in wings radiating out from a central hall. Other advances in the humane treatment of prisoners included provision of sanitary arrangements for the cells, as well as heating, lighting and ventilation of each one. 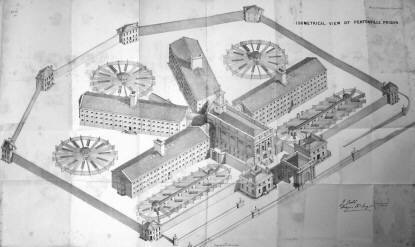 Jebb produced this report for both Houses of Parliament when the prison opened. All aspects of the building are discussed and illustrated, notably the central-heating system. Modifications made during the course of construction, such as the placing of the foul-air ventilating flues in the roof rather than in the basement, are also accounted for. 8vo. 62pp, 22 folding litho plates (1 tinted), the last 2 plates rather browned and spotted. Orig. cloth, lower board bowed.